Alison Bender holds degrees in English and Psychology from Penn State University. 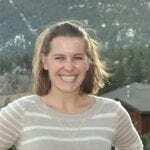 A freelance writer and editor, she lives in Reno with her husband, two young daughters and her dog, and spends her free time hiking, running and writing. Alison loves to travel and has run with the bulls in Spain, jet packed in Mexico and kissed the Blarney Stone in Ireland. She is also a voracious reader, though her reading list of late includes more Dr. Seuss than Doctor Zhivago.